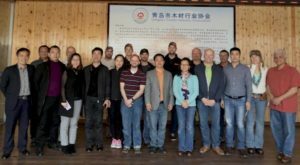 A delegation of six forestry businesses from Wisconsin, along with representatives from the Department of Agriculture, Trade, and Consumer Protection and Scott Lyon from the Department of Natural Resources, participated in a trade mission to China on March 20-April 4, 2018. The purpose was to explore and expand markets for Wisconsin’s forest products. The delegation met with potential Chinese wood buyers and lumber industry associations during each major city visit in Tianjin, Qingdao and Guangzhou. Wisconsin forestry companies also met one-on-one with buyers during matchmaking meetings and receptions at each city location. During the receptions, DNR’s Scott Lyon presented about Wisconsin’s forest resource, forest products industry, and the benefits of using U.S. lumber. To assist in promoting and developing markets for Wisconsin’s softwood resource, Lyon provided samples and literature of both Eastern white pine boards and red pine lumber to buyers. The delegation also had the opportunity to tour two furniture manufacturers and timber markets and distributors where wood manufacturers purchase lumber. They also visited Asia’s most comprehensive woodworking machinery and furniture trade show, Interzum Guangzhou. This provided attendees the opportunity to visit with Chinese buyers at the American Hardwood Export Council and American Softwood Export Council pavilion and to see the newest woodworking equipment in action. While in Guangzhou, the delegation met with the USDA Foreign Agriculture Service for a briefing on the Chinese economy and imported wood demand. Opportunities for forest products in China are endless. Starting this year, a new ban on logging natural forests in three northeast provinces in China has increased demand for imported forest products. China has now become the world’s largest furniture production base and exporter, shipping hardwood furniture to Europe and the U.S. Despite elevated levels of exports, most wood products produced are staying domestically in China due to the increased wealth of the Chinese middle class and subsequent demand for quality solid wood furniture and flooring. The Chinese furniture industry, which originated in southern China, now has started to move to northern provinces. There are 45 furniture manufacturing clusters in China. The Guangdong Province in southern China, where we visited, has the highest concentration of the furniture industry with the highest production output. There are also many lumber distributors and importers in this area to supply the many manufacturers. Most furniture manufacturers in Guangdong use 60% hardwoods for their products. The city of Qingdao in the Shandong Province in northern China is an emerging furniture base with more than 1,000 furniture producers. In addition to the growth of the furniture industry, economic outlook for China remains positive with annual GDP (gross domestic product) growth rate of 6.9% in 2017, due to improved external environment as well as a strong domestic demand. The trade delegation noted high rise apartment and business buildings being built across the country, so the need for wood for construction purposes, in addition to specialized uses, is strong. During the matchmaking meetings and company visits, the trade delegation learned that U.S. log importing has increased recently because of several factors, including a lower value-added import tax on logs versus lumber. Also, Chinese manufacturers are demanding customized services such as sawing lumber to their specific thickness requirements, such as 1.6 cm (5/8”), 1.9 cm (3/4”), 2.2 cm (7/8”), 2.3 cm (5/16”), and 3 cm (1-3/16”). Typically, U.S. sawmills manufacture lumber to different thicknesses (4/4, 5/4, 6/4, 7/4, and 8/4). If U.S. mills began to saw lumber to these Chinese specifications it could potentially cause excessive waste in wood and production time. However, some companies that we met preferred U.S. hardwood lumber because of the high quality and consistent manufacturing. An additional opportunity for forest products is a demand for wood pellets. However, one of the major barriers for Wisconsin companies is high freight costs for products to reach Chinese ports compared to east and west coast U.S. forest products facilities. Major hardwood species imported from the U.S. include red alder, ash, black walnut, basswood, black cherry, white oak, red oak, hard maple and tulip poplar. These species are primarily used in furniture, moldings, doors and windows. The trade delegation learned that some Chinese buyers are not familiar with soft maple and aspen. They said both hard and soft maple are not as popular with consumers compared to the other U.S. wood species. Rubberwood from Thailand and Indonesia is also imported for furniture production, along with other top imported hardwood species: birch from Russia, softwood lumber from Europe, radiata pine from New Zealand, and eucalyptus logs, lumber and pulp from Brazil. Softwood species applications consisted of exterior siding, ceilings, flooring, door framing, beds and furniture. Softwood dimension lumber is primarily used in building and bridge construction for concrete forming. During the furniture plant visits and tours, delegates noted that, over the past three years, most production facilities are installing optimized manufacturing equipment because of the rise in labor costs. Lyon also had the opportunity to visit and lecture at Northwest Agriculture and Forestry University in Yangling, one of the top research-oriented schools in China. He presented on Wisconsin’s forest products industry and market opportunities for U.S. forest products in Central America. The university’s Wood Science Department is ranked second out of 15 in China. They offer majors in wood science and technology and furniture design. Both majors combined have, on average, 90 students with the majority majoring in furniture design. This visit allowed Lyon to better understand the local forest products industry by visiting local sawmills and gaining knowledge on the educational training requirements for students looking for a career in the wood products industry in China. Following are a few photos offering highlights from this 2018 international wood products experience. 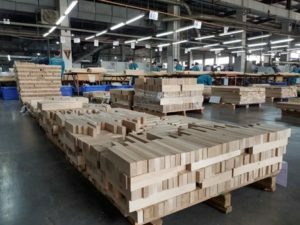 Shown here, a Taiwanese-owned furniture component manufacturer uses U.S. hardwood lumber in Qingdao, China. These components are primarily exported to Europe or used domestically in furniture manufacturing. 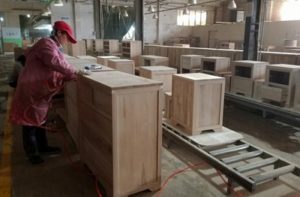 These furniture pieces, produced by a Chinese-owned furniture manufacturer in Qingdao, China using U.S. lumber , are primarily exported to Europe. U.S. ash logs being scaled and graded at a Chinese sawmill in Guangdong Province. The Wisconsin forestry delegation meeting with representatives from the Qingdao Timber Industry Association. DNR’s Scott Lyon is in the middle of the front row (wearing the striped shirt).